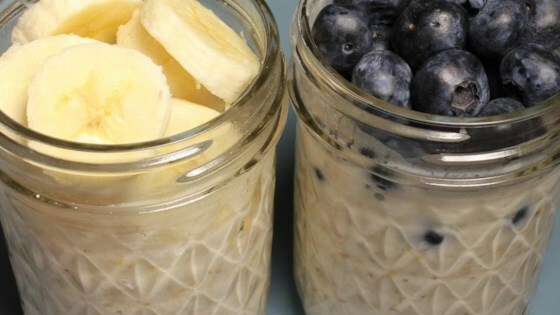 "This on-the-go cold breakfast is portable, quick to make, healthy, and great-tasting! You may also add honey to sweeten the oatmeal. Also good with diced apple or other seasonal fruits." Stir oats, yogurt, and almond milk together in a jar with a lid. Twist lid onto jar and refrigerate, 8 hour to overnight. Stir oatmeal and add banana when ready to eat. You must try this overnight oatmeal flavored just like chai tea! You may also mix ingredients in any container that has a lid or that can be covered with plastic wrap. This was so easy and pretty good, I will make again.